I am constantly discovering new recipes, restaurants, and learning new things about food: so much, that it is worth doing an end-of-the-month roundup to write about my experiences. And in this case, a two-part roundup (I have a feeling there will be many of these). If you want to be the first to learn about my foodie adventures as they happen- by all means, follow my Instagram account- but to read all about the food in one place, you’re in the right place. Though we didn’t see any whales, we did see lots of dolphins, and I had a great time with some of my girlfriends! What a treat. I thought lots of these snacks would be great for a picnic, and trip to the beach, as well. Around Thanksgiving, animal shelters may have events honoring the turkeys. Some friends and I attended the event where we had a delicious meal, listened to some presentations about their work, and were able to interact with the animals. Their Thanksgiving meal had a really homemade touch, and felt like it was made with love. Turkey sandwich- yes, you can make a turkey sandwich using substitute turkey. It was made more visually interesting on marbled bread, and the addition of thinly sliced apples, and red onions, were delicious. Store-bought samosa- easy side dish! Kale salad- this was so well done, it was my favorite part! The crunchy and beautiful purple cabbage, the garbanzo beans, roasted squash, and cranberries, made this a favorite among my firneds. Cupcake- delicious! Made especially pretty with special piping. Have you ever tried piping before? It’s really just squeezing frosting out of a bag, and makes an extra special touch. With hot apple cider for guests, on the crisp fall day, it was a wonderful event to celebrate the turkeys. Comoncy in Beverly Hills is a small, but very sweet café with delicious food and coffee! The salads and avocado toasts are beautifully garnished with watermelon radish, which is a vibrant pink and green and looks like a watermelon. Unfortunately, I wasn’t able to get a good enough photo- my family was hangry and sometimes it takes me a while to get a shot, so I understand. I am extremely particular when it comes to coffee, and I was especially delighted that this coffee was as delicious as it was cute! This is a great spot for a quick bite and I will be back. Have a seat and enjoy your coffee- but try to avoid coming during busy hours, the word is clearly out that this place has delicious, beautiful food. 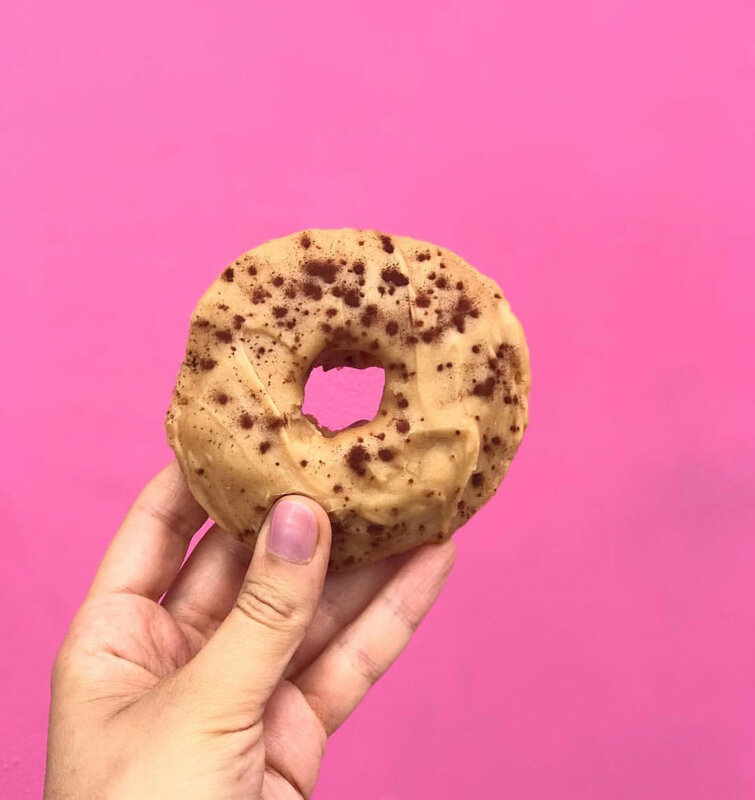 There are a lot of delicious donuts in LA, and I love each and every one of them- they are truly unique and special in their own ways. But I crave these ones. Let me tell you how good these donuts are: you know that bloggers will often take multiple photos at one meal, or in one outing, in order to have more content? I came to Trejos Donuts on a Sunday, got a craving and came back at the end of the week, and was hoping my followers would assume that I was just getting multiple content on one day, rather than someone who keeps coming back to the donut shop. When you hope people find the truth about you… there might be a problem! These donuts remind me of the old-fashioned style- with a very sugary crunch exterior that I personally love. There are usually around 5 vegan options, and they offer some seasonal flavors, so follow on Instagram to keep up to date. Oh, and they also have a donut happy hour at the end of the day, offering ½ price donuts. Resistance is futile! I hope you enjoyed this new type of food roundup blog. More great food to come in Part II!